The number of cattle slaughtered in Brazil reached 31.86 million heads in 2018, the highest level since 2014. The higher rate of slaughter increases the risk of even more cattle-driven deforestation occurring in Brazil. 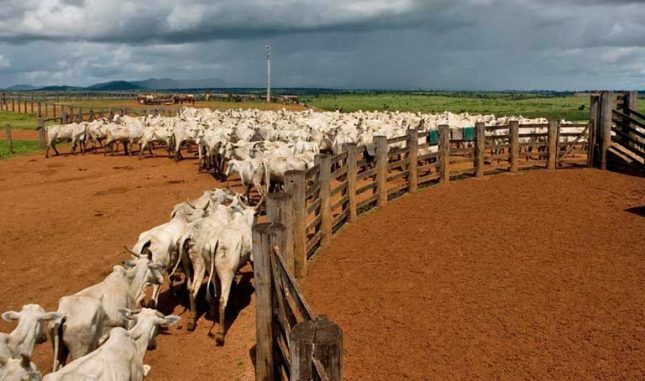 As Chain Reaction Research (CRR) highlighted in a report last September, the cattle industry is a major driver of deforestation in Brazil, which has the second-largest herd globally. Increased deforestation represents major risks for companies that own slaughterhouses and sell beef at retail stores. Among beef producers, JBS (the largest), Minerva, and Marfrig are the most exposed to deforestation-related risks. CRR listed the following retailers as dominating the Brazil market and having high exposure to risks from cattle-driven deforestation: Carrefour, Groupe Casino, Walmart Brasil, Cencosud, and Grupo Muffato. CRR’s recent reports on retailers Cencosud and Carrefour show how both are exposed to financial and reputation risks from purchasing beef from slaughterhouses possibly linked to Amazon deforestation. Livestock farming makes up more than seven percent of the country’s GDP. The increasing number of cattle slaughtered in Brazil is a result of high domestic demand and rising beef exports. More than 80 percent of beef produced in Brazil is consumed domestically, and the export market is lucrative. Volumes to China and Hong Kong now make up almost half of total exports. Beef exports reached 115,450 tons last month, the highest total ever for February, an 18 percent increase versus the same time in 2018. Total revenues for February were USD 433 million. Given the higher number of cattle slaughtered and favorable economic conditions such as the strong U.S. dollar, exports are likely to continue to remain elevated. Moreover, new Brazilian President Jair Bolsonaro favors looser restrictions on the agricultural sector, paving the way for more risks connected to cattle-driven deforestation.